This is WOW News 247: 3 Dead, 2 Injured in Washington Mall Shooting! 3 Dead, 2 Injured in Washington Mall Shooting! A gunman armed with a rifle is on the loose after three women were fatally shot Friday night at a shopping mall about 65 miles north of Seattle, Washington State Patrol said. 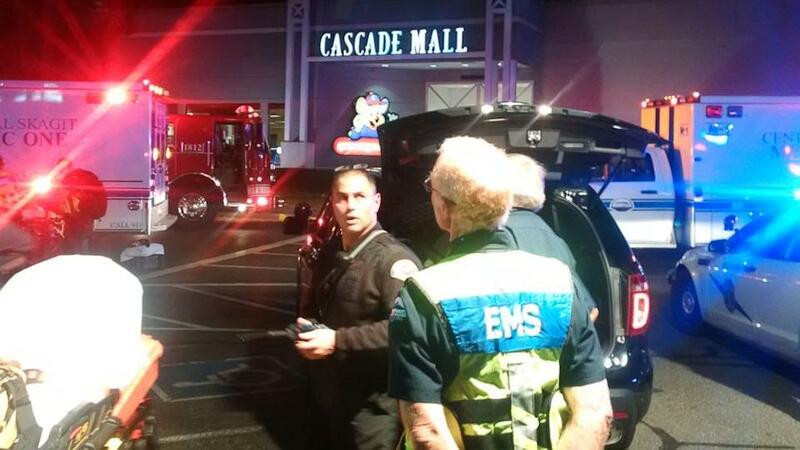 The shooting occurred at Cascade Mall in Burlington, Washington, before 7 p.m. local time. In addition to the three women fatally shot, one male sustained life-threatening injuries and one female sustained non-life threatening injuries, said Sgt. Mark Francis, a public information officer with Washington State Patrol. Police initially said four people were dead. The male victim with life threatening injuries was airlifted to Harborview Medical Center in Seattle and "most likely will pass away," Sgt. Francis said during a press conference. Harborview spokeswoman Susan Gregg confirmed the male victim arrived at the facility in critical condition via airlift around 9:30 p.m., adding "we are not expecting any others." Sgt. Francis described the shooter as a "Hispanic male wearing grey," who who last seen walking toward Interstate 5. His motive is unknown. In a subsequent tweet, Sgt. Francis tweeted a photo of the suspect, writing "Here is the shooter. We believe just one shooter ... Armed with rifle." Sgt. Francis said four of the victims were found in Macy's. "We believe all five were [found at Macy's] but it has not been confirmed if the fifth was yet," he said. "Out of nowhere I just hear somebody yell and then after that, I turn around and just look at the Macy's and I just hear shots," Armando Patino, who was working the T-Mobile store, told ABC affiliate KOMO. "I hear one shot and then stand kinda still and like two three other people start running out saying gun." Patino added, "I turn around and run to the store. Some people didn't know where to go. I just moved them into the [T-Mobile] store. We went in the back where we have a door and everything and we just stayed there until they told us to evacuate." Stephanie Bose, an assistant general manager at Johnny Carino's Italian restaurant near Macy's store at the mall, told The Associated Press she immediately locked the doors to the restaurant after hearing about the shooting from an employee's boyfriend. "He was trying to go to the mall and people were screaming," she said. "It was frantic." She added, "Then I heard seven or eight more, and I just stayed quiet in the dressing room because it just didn't feel right. And it got very quiet. And then I heard a lady yelling for help, and a man came and got me and another lady, and we ran out of the store." Law enforcement officers performed an initial sweep of the mall to ensure it had been evacuated, followed by a secondary search. Sgt. Francis said police began receiving calls of an active shooter before 7 p.m. In addition to state and local law enforcement, both the FBI and the Bureau of Alcohol, Tobacco, Firearms and Explosives have also responded to the shooting. The FBI tweeted it has "no information to suggest additional attacks planned in WA state." ABC News' Benjamin Stein, Devin Villacis and Jessica Rooney contributed to this report.